To me cooking with ginger immediately means delicious ginger snaps, gingerbread or other sweets enhanced by this delicious spice. This is how I have used this product for many years. In more recent years I have found that fresh ginger adds a delicate touch to Oriental meat dishes. Ginger is often used in curries and other vegetable dishes. It is also used in beverages such as beer, wine, teas and coffee in different parts of the world. When cooking with ginger, you will find it available in several different forms. Fresh ginger has a wonderful flavor and is the perfect ingredient for most recipes. I like to keep plenty of dried ginger to use in my tea and it will last forever. Dried ground ginger is great to keep on hand for baking. It is a great back-up if you run out of the fresh ginger. All forms of ginger are delicious and have a purpose in your cooking. Studies have suggested that ginger is beneficial for medicinal purposes. It has proven useful for many causes of nausea. Ginger tea is a common folk remedy for colds and suppresses coughing. Ginger has also been historically used to treat inflammation such as arthritis. Wonderful health benefits make this spice even more appealing to add into our cooking. Cut chicken breast into bite size pieces (Should have 24 to 30). Combine marmalade, soy sauce, ginger, olive oil and garlic in a bowl; add chicken to bowl and toss to coat. Cover bowl and refrigerate to marinate chicken for about 1 to 2 hours. Heat oven broiler placing rack about 5-6 inches from heat; spray broiler pan lightly with oil and set aside. 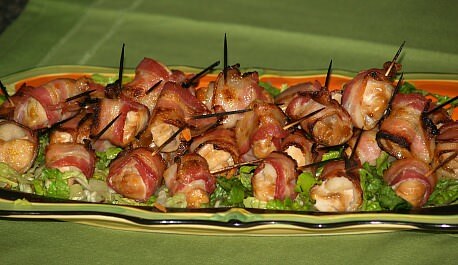 Wrap each piece of chicken and ½ water chestnut with ½ slice of bacon; hold together with toothpicks. Arrange wraps on prepared broiler pan; broil about 3-5 minutes until bacon looks crisp. REMOVE PAN from oven and carefully turn wraps over; broil another 3-5 minutes making sure chicken is thoroughly cooked. Makes 24 to 30 appetizers. MOO GOO GAI PAN RECIPE Cooking with ginger enhances this Oriental recipe. Cut chicken breasts into 1 inch thick slices; mix chicken with soy sauce, sherry, cornstarch, ginger, sugar and garlic powder and set aside. Slice mushrooms and broccoli thinly; cut onions crosswise into 3 inch pieces. Heat 1 tablespoon oil in a large skillet over medium high; cook mushrooms, onions, water chestnuts and broccoli stirring quickly until mushrooms are tender. With spoon remove mushroom mixture to a bowl; add 3 tablespoons oil and cook chicken mixture stirring quickly until chicken is tender and cooked done. Return mushroom mixture to skillet; add peas and heat through. Serve over rice. Cooking with ginger and making these delicious cookies. Shape into small balls, roll in granulated sugar and place on ungreased cookie sheet allowing room to spread. Cooking with ginger makes this delicious ginger bread recipe. In a large mixing bowl, cream together the butter, sugar and eggs; add molasses and vanilla and blend well. Sift flour, baking powder, baking soda and spices together; add to cream mixture alternately with lukewarm water. Combine honey, ginger, lemon juice with boiling water in a heat proof bowl. Pour tea through a strainer into ice filled glasses; top with lemon wedge.